As a Special Offer for returning Senior / Executive Level Package Customers! If you have previously purchased an Senior / Executive Level Deluxe, Grand or Ultimate Package you have the option now of purchasing additional Follow-up / Thank You Letters at any time during the discount period at this special reduced price. Delxue Package: Up to one year from original package purchase. Grand Package: Up to two years from original package purchase. Ultimate Package: Up to two years from original package purchase; also, special benefits apply. We know, as a job seeker, candidates are applying for more than one position at any one time. Or need to keep their materials current. That’s why we offer a special discount for producing revisions to your Follow-up / Thank You Letters so each will be tailored-made for each of the positions / focuses you are seeking or as a refresh to keep them as up-to-date as possible. Too often sending a simple follow-up or thank you letter is overlooked. Don’t miss the opportunity it affords you to restate your value-added proposition. Sending a follow-up or thank you letter reminds the employer/recruiter about the key points of your interview and why you are the best person for the position. It’s an excellent chance to again present your qualifications and strengths, and do so in a professional manner. It can make a difference in your career, so don’t miss the chance to make a final strong impression. This custom-made letter is designed to showcase your qualifications, strengths and highlights that will make you stand apart from the competition. It’s exceptionally priced for just $59.95. Don’t delay, order your letter today! Don’t neglect the value of a follow-up letter. This too is an important component in the job search and you can distinguish yourself from the others with a well-written one from Sequence. Consider this: the employer has thought enough of you to invite you to an interview. They have invested their time to get to know you. You’ve met with the organizational leaders. Now make a final, lasting professional impression by sending a follow-up thank you letter that reiterates the important points of your discussion and remind them one more time why you are the best match to the opportunity. 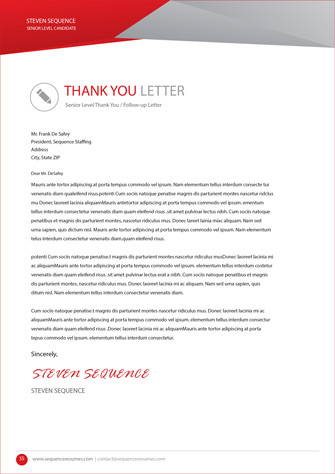 Let Sequence help you make a difference today with a compleeling follow-up / thank you letter. Why a Sequence Follow-Up / Thank You Letter? We interact daily with some of the most well-known and respected employers throughout the U.S. and around the world, we know and understand what employers are looking for in a job candidate. It’s why our products and services are so successful at capturing their attention and can significantly increase your brand awareness in the job marketplace. Our letters are written to make you stand out after the interview. We customize every follow-up / thank you letter for the job you are seeking. Generic letters simply don’t work. In fact, they work against you because employers can perceive that you simply don’t care enough to put the effort into producing a sincere thank you letter that tells them in a compelling, articulate manner how grateful you are for the meeting. It’s also one more chance to remind them of how your qualifications fit and why you are the best match to the opportunity. Our tailor-made thank you letters will make a difference and truly help you to stand apart from the competition. Once you contract our services, you will be assigned to a professional with vast experience recruiting, branding and marketing job candidates; who works closely with employers recruiting and screening candidates and resumes; has a proven track record producing thousands of letters, including follow-up and thank you letters, and other vital personal brand materials; possesses a keen knowledge of the employment landscape; and is a highly capable career planning and development consultant. We will develop an objective and timeline that suits your schedule, and work closely with you to fulfill our commitment to you to your complete satisfaction. We proudly stand behind our products and services. That’s why we have happy, satisfied customers that generously refer us to others and return back to us years later. We guarantee you will be completely satisfied and will make sure you receive the product and service you gladly purchased and deserve. All of our letters are produced in MS Word and/or PDF formats.